Looking for a pasta recipe with a new twist? 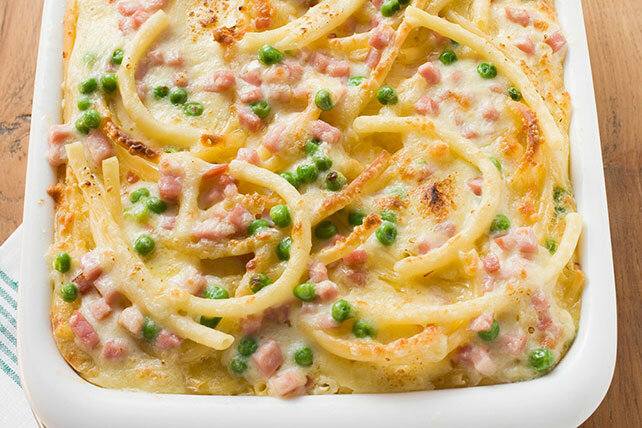 Try this easy oven-baked pasta casserole that's made with peas, ham, cheese and pasta for a great spring recipe. Break pasta in half and cook according to package directions, omitting salt. Meanwhile melt 1 Tbsp. butter in skillet over medium-high heat. Cook onions until softened. Add peas and pepper; gently cook for 3 min. Remove skillet from heat. Stir in ham and 1/4 cup cheese; set aside. Heat remaining butter in medium saucepan; stir in flour and gradually add milk. Cook on medium heat 3 to 5 min. or until thickened. Combine pasta, ham mixture and sauce. Pour into 13x9-inch baking dish. Sprinkle with remaining cheese. Bake 20 min. or until heated through and cheese is golden brown. Prepare using leftover chicken instead of ham.